I'm not one of those girls that changes their entire routine with the season. Sure I change some things (I for one am looking forward to not having to use aquaphor as hand cream), but since I tend to stick to neutrals year round I don't need to switch out any products aside from a few lipsticks and glosses. And so I give you, five beauty products I'm currently loving. 1. "Grace" is by far my favorite red lipstick. It's a classic red, aptly named for Ms. Kelly. It's perfectly pigmented, long lasting, and hydrating. As much as I love NARS' "Heat wave", I find it a bit too dry. After an hour or so my lips feel too dry. Obviously I'm doing something wrong. 2. This Sephora lip liner has been a live saver. It goes on clear so you don't need to worry about matching it to the shade you're wearing, which is something I love as I bounce back and forth between reds and pinks all season. 3. We have been in desperate need of a new hair dryer for, dare I say, years. Our old one makes a screeching sound if you hold it the wrong way, which you could say complicates the process of styling your hair. 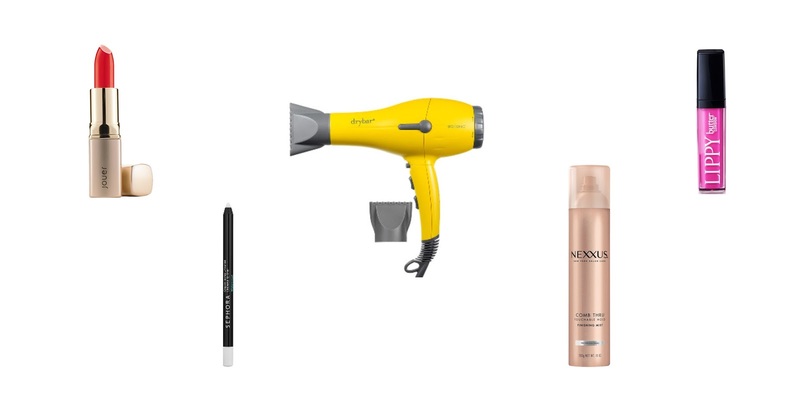 I spent about a month researching the best hair dryers on the market and figuring out what I wanted from one. I found this guide very helpful when it came to narrowing down what features I was looking for. In the end I decided to go with Drybar's Buttercup. The very first day out of the box I stood in front of the mirror asking aloud "what kind of sorcery is this?" JD laughed but my hair looked amazing. No frizz, tons of volume, pure magic I tell you. * Please note this is not a paid advertisement for Drybar, I'm just in love with this hairdryer. 4. Let me start by saying that my hair is pretty much resistant to being styled. If I curl it, it will be straight within half an hour tops and hair spray and styling products only make it look worse once that happens. This hairspray however has been working wonders, holding curls longer (obviously not all day long as this is my hair we're talking about) and is extremely lightweight so you don't get that gross stiff feeling. I'm not crazy about the old fashioned hairspray scent but it's working and that's enough for me. 5. I love this lip gloss (and it's matching nail polish, also named "Primrose Hill Picnic"). It's very bright so I usually put on just a little bit when I wear it. It's not too sticky, which is important if you have hair, and stays on all day. And that's that. What beauty products are you currently loving? Finding the perfect red lipstick can definitely be tricky so thank you for the suggestion!! And I know what you mean about needing a new hair dryer. I've been slow to invest in a good one but I think it's time! Seriously why have I never heard/thought of a clear lipliner that is completely genius! I'm with you, for the most part I don't change my routine, except adding pastels and neons during spring/fall. I love red lips all year. I'll have to try this one! I definitely need to try the hair dryer!